Hey. A guest post from my equine-friendly step-sister Judy who ventured across the county border to Limerick City and posted this bulletin. Living in East County Clare, Limerick is my nearest city and I go there fairly regularly. 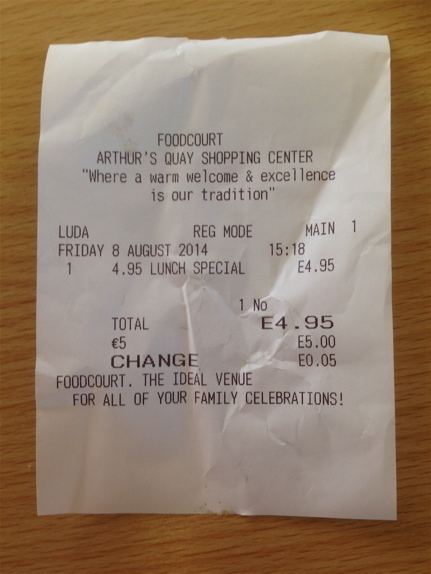 Recently I noticed several establishments offering lunch for a fiver or less. Had I not been familiar with the eatforafiver blog I would probably not have paid any heed to them. 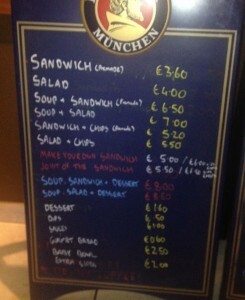 However, I determined to eat for a fiver on my next visit to Limerick. Limerick, perhaps surprisingly to some, is, at 91k, Ireland’s third largest city, beating Galway by some 15,000 and being nearly twice the size of Waterford. It is Ireland’s first National City of Culture and there is lots going on. Of course it is also home to Munster Rugby and I have many times left the superb Thomond Park venue more than a little hoarse from screaming encouragement at our wonderful Red Army. The atmosphere in Thomond Park, especially on those occasions when the Boys in Blue descend on us from Dublin, is second to none. I digress as today was eatforafiver day for me. 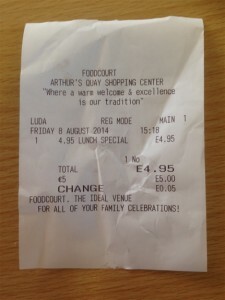 I headed to Arthur’s Quay Shopping Centre as it has several establishments offering food (more than just soup and a roll) for the requisite price and opted for a Chinese stir-fry. The place was empty, but I put this down to the fact that I was only getting around to lunch at three o’clock in the afternoon. 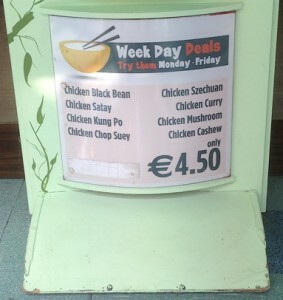 The menu board outside boasted a good selection of familiar sounding beef (€5) or chicken (€4.50) dishes and I ordered a beef dish with noodles only to be asked for “six euro please.” Polite questioning elicited that rice, noodles or chips were one euro extra. 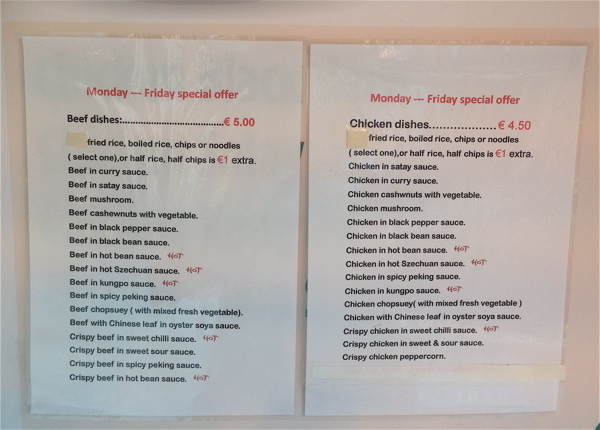 Looking at the menu board again I guess technically it does state this but I found the wording misleading (half & half €1 extra is what I saw) and think I can be forgiven for misinterpreting it. Indeed eatforafiver has several postings from Chinese restaurants with very tasty looking and positively reported on meals where rice or noodles were included in the price. Oriental Emporium on Abbey Street (31st October 2013) in particular had my mouth watering. Unfortunately today I had no option but to cancel my order. … where, for €4.95 I could have a chicken, ham, mushroom & spinach pasta bake with side salad or chips. Sounded pretty good. Must have been because by the time I got there it was sold out. However, I was offered in its place a pulled pork wrap, again with a choice of salad or chips. Acceptable. I opted for the salad. The wrap was hard and dry underneath, I deduced as a result of having been sitting on a warming tray for at least a couple of hours, but OK on top. The pork was cut into several small chunks and definitely not pulled (which seems to be the “in” word for pork these days) but hey, at €4.95 I wasn’t complaining. Mixed with the pork was a sparse selection of chopped soggy vegetables, all served in an inoffensive though rather sweet sauce, which provided the only flavour to the dish. 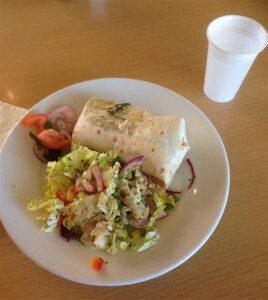 The salad was crisp and enjoyable. I imagine that this restaurant does a very good lunchtime trade. 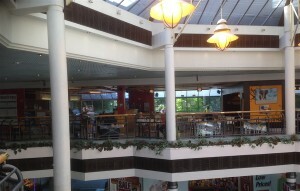 The seating area is open, clean and bright, with plenty of well spaced tables. 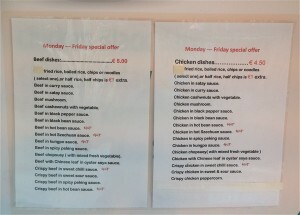 Other food options were bacon and cabbage for €8.95 and chicken kiev for €7.95. 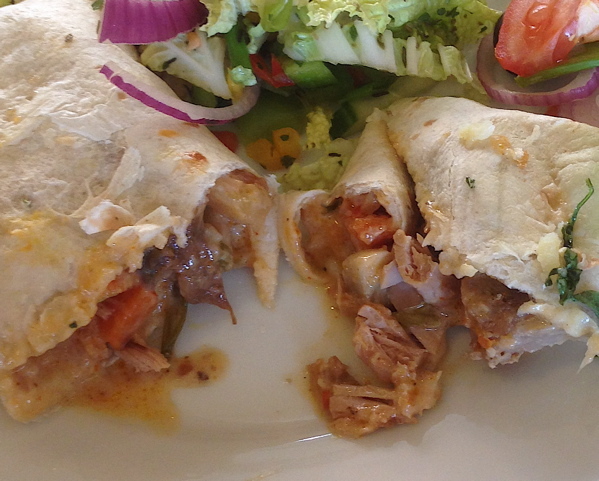 The pork wrap was also offered for €6.95 served with veg & mash or chips & salad and I suspected was only offered to me at the lesser price, but with less choices, to use it up. However I didn’t mind this. I believe I could also have had a free tea or coffee but a glass of water suited fine on this occasion. 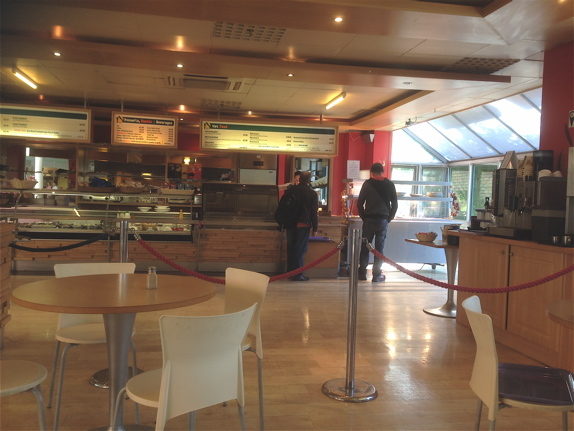 Overall impression: Staff – friendly; salad – tasty; pork wrap – could not have told you what it was from taste alone, thus disappointing; Chinese – feeling duped as I think it a fair assumption that a stir-fry is served with at least rice included in the advertised price. 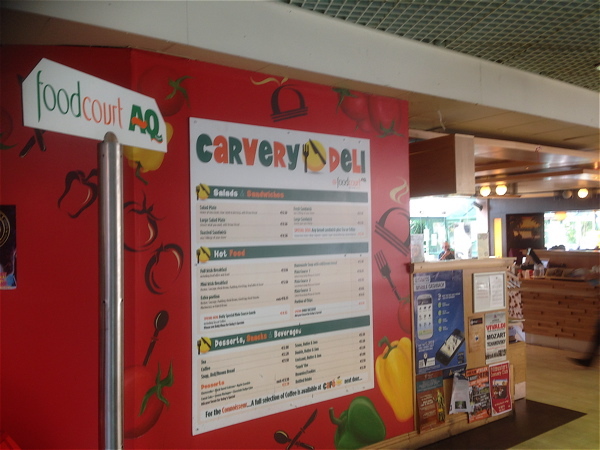 I would like to visit the Carvery/Deli again sometime, at an earlier hour, to hopefully sample the pasta bake. That man Garwin Liu has a good nose for cheap, filling food. This is the guy who recommended Star Pizza and the Oriental Emporium, where I’ve had two great feeds. 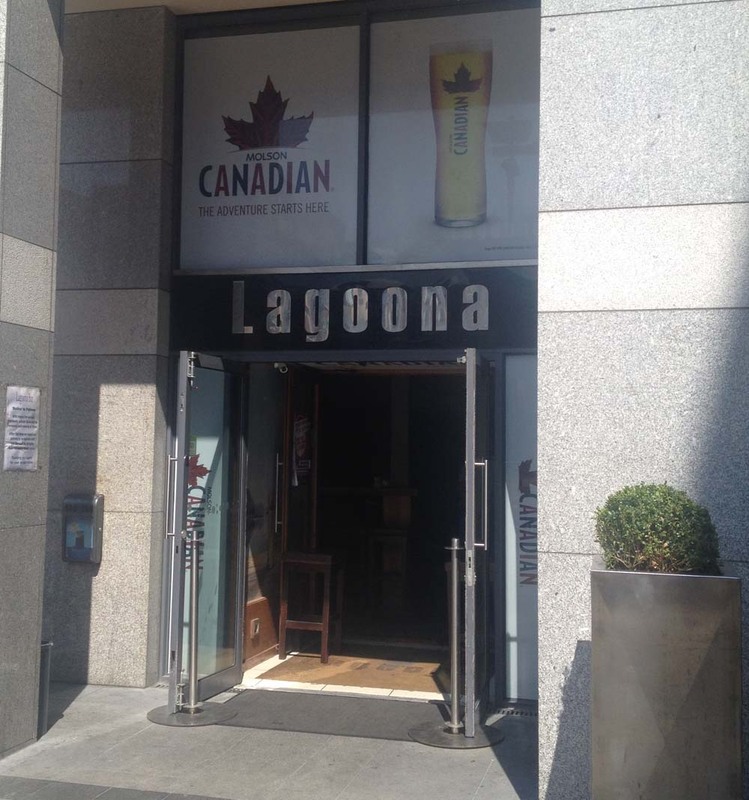 He told me about the Lagoona Bar, just opposite the National College of Ireland on Mayor Street in the IFSC area ages ago. I was a little reluctant to go because the last time I was in that area I got stuck in an almighty traffic jam that lasted for ever. Anyway, Garwin was in touch again recently through the eatforafiver Facebook page and mentioned Lagoona again. Guilt and curiosity combined today with a little flexibility in the middle of the day and the availability of a feeding partner: the young lad, on interminable school holidays, and perpetually peckish. I think part of the problem the last time I was in Mayor Street was that the Luas tracks were being laid and the place was a mess. It’s all settled down now and today the area, even out of term time, was hopping. I have a pal who used to work in NCI some years ago when it first moved from Ranelagh. Back then, NCI was a bit lonely among cranes, not yet occupied office blocks, remnants of old dockland buildings and a lot of hoardings. Then, it was difficult enough to find somewhere to eat. Now you can’t move for bagel bars, pubs, pizza parlours, sandwich shops and pricy pasta purveyors. 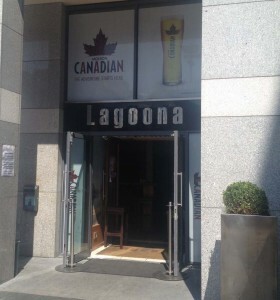 The Lagoona is a big place, situated in a corner of Custom House Square which is home to several other bars and restaurants. 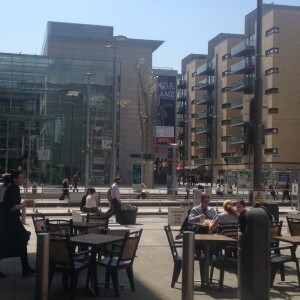 It was a pleasant day and most other establishments had several tables and chairs outside to facilitate al fresco dining. The Lagoona had two quite high tables, one of which we nabbed when we’d got our food. 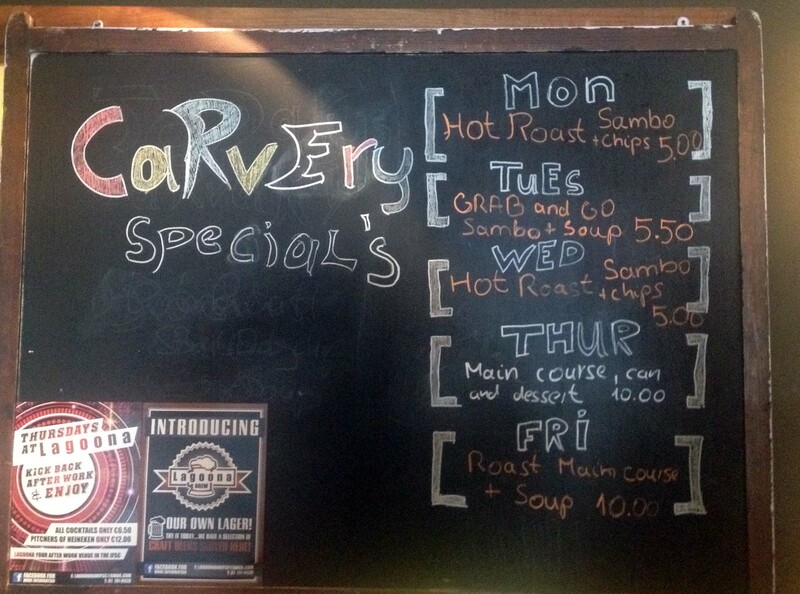 Garwin told me that Wednesday’s special was roast meat in a roll with chips. And he was right. 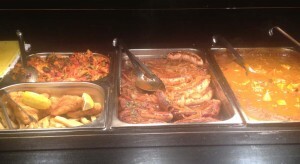 The choice of meats was beef or pork. 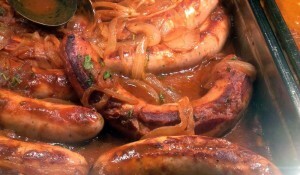 The young lad opted for beef and I went for the pork. 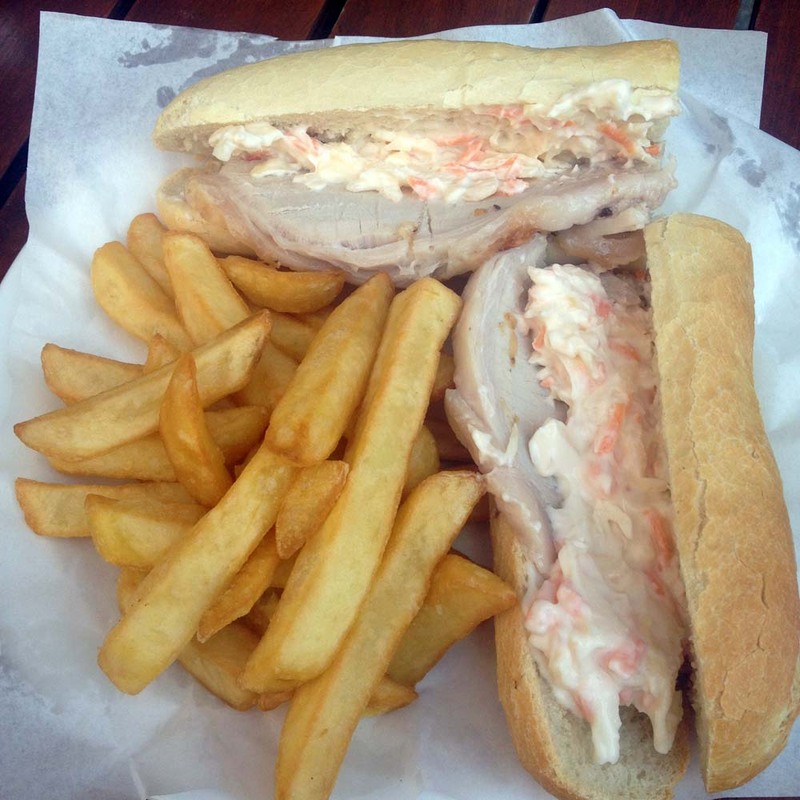 You can opt for different breads if you want and also have a few salad items to accompany the meat: lettuce and mayo for the young lad and coleslaw for me. 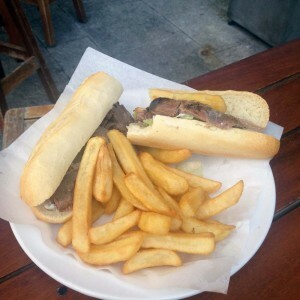 The portions of roast meat were generous and the meat was nicely cooked, moist and tasty. The rolls were pretty standard but fresh. The chips were a little hard, probably from being kept warm for a little bit too long. 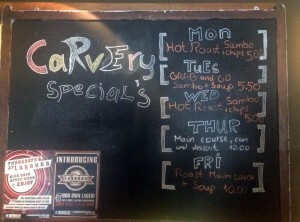 Still, hey, this was a pretty decent feed for a fiver. 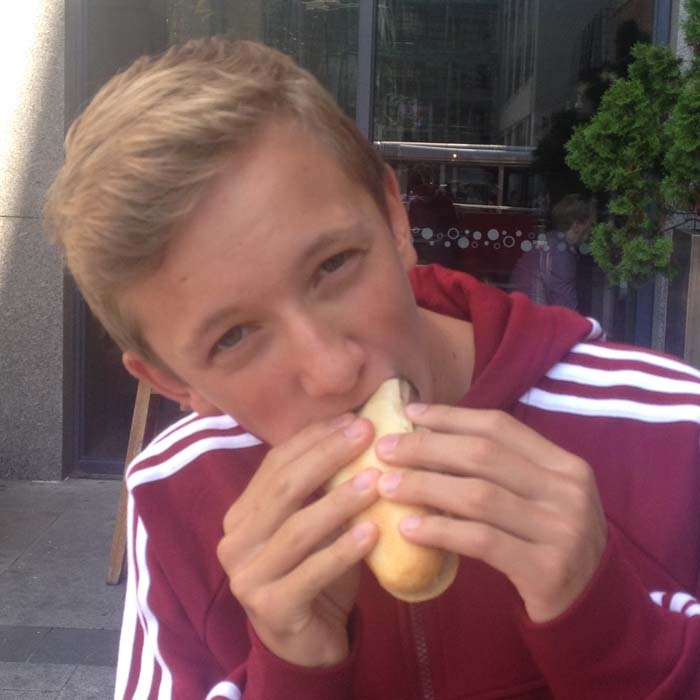 I think in the amount of meat stakes, the young lad was the winner. 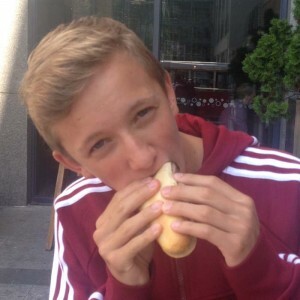 … including this whopper sausage. We took a little wander around after our lunch to see what else was on offer. The odd thing was that the Lagoona seemed to be the least busy place in the area. Maybe it’s because it’s principally a bar. Maybe it’s because it’s a bit dark inside. 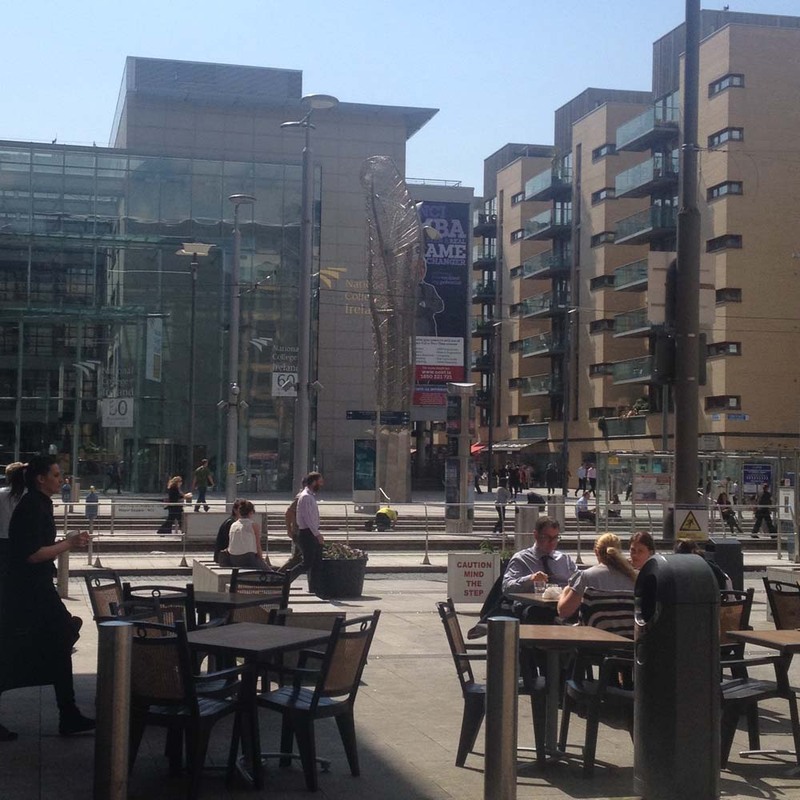 Maybe it has too few tables outside and maybe they are the wrong sort of tables. They’re high, man-type tables. Maybe it’s mainly a student place and it’s not term time. I don’t really know. Anyway, thumbs up for Lagoona. Meat, bread, chips. Cheap and filling. Nice one. 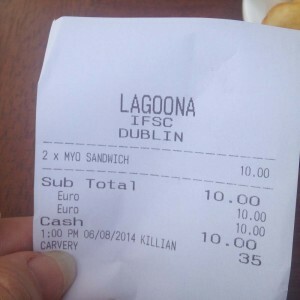 Lagoona is on Facebook and Twitter, btw (thanks @MsFrugalone for the latter link).